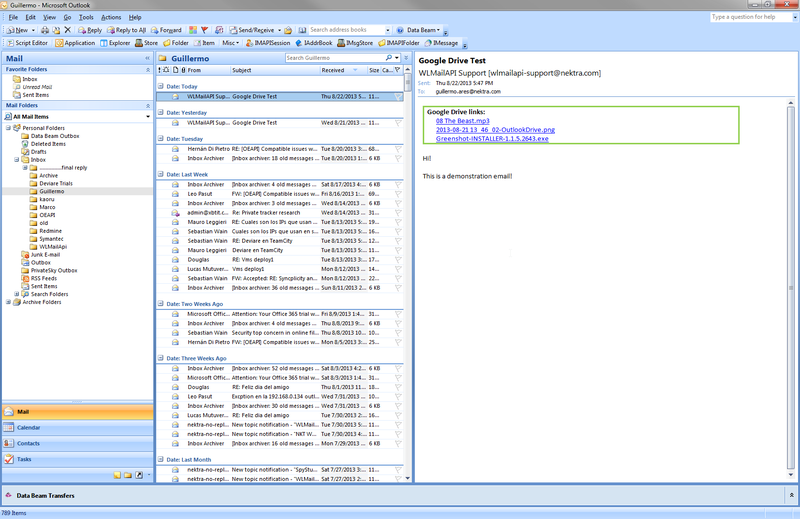 You can download our free Outlook Add-In for Google Drive to sample our Outlook managed file transfer services. Several issues arise when sending large files with Outlook: there is a data overhead for each binary attachments sent via SMTP, Microsoft Exchange limits the size of attachments, and servers often have e-mail quotas. 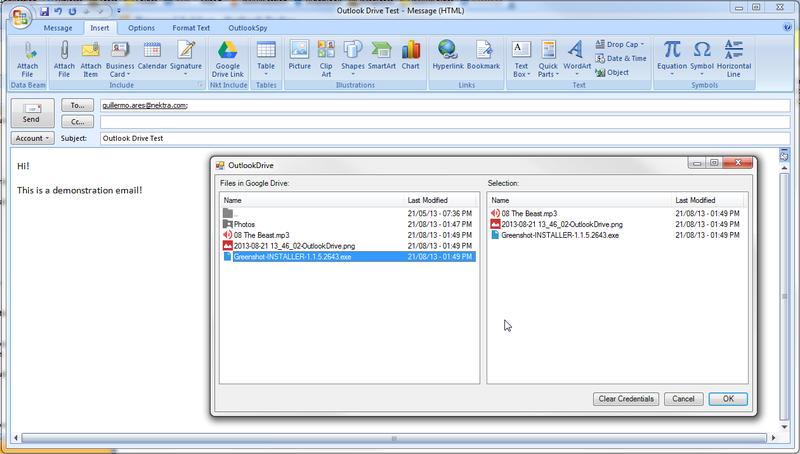 In Integrating Dropbox with Microsoft Outlook we provide a free Outlook add-in to send large files via DropBox. Google Drive is cheaper than DropBox: to send virtual machine images or large media files you need 200gb of storage. On DropBox this costs $ 19.99 per month while on Google Drive it costs $ 9.99. Microsoft SkyDrive is in the same price range as Google Drive. In the “Insert” tab, you will find a new button named “Google Drive Link”. Click it. A window with two lists will be displayed. The left list is the root directory of your Google Drive account. Select the files you want to share with the email’s recipients and add them to the list on the right either by double clicking files or by using the right mouse button. 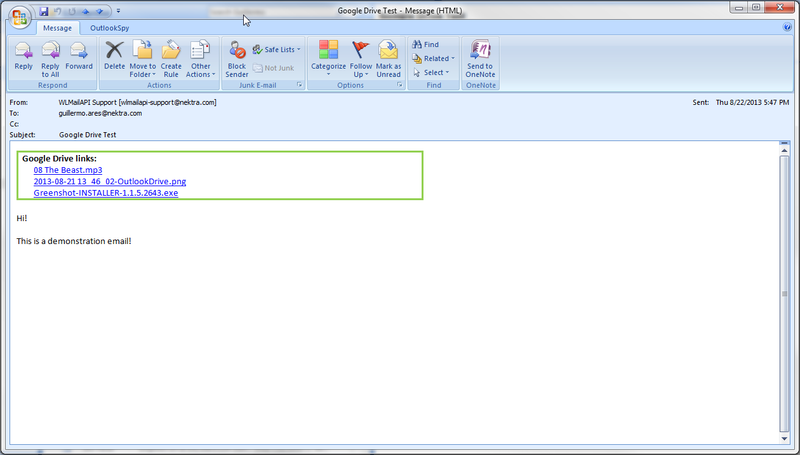 The files shown in the list on the right will be persisted until the email is sent or the compose window is closed. Send the email. The recipients will receive links to the files and an invitation email from Google Drive to share any files that were not public. The add-on was developed by Guillermo Ares, part of Outlook Plugin Development. Also, he was helped by Windows Software Development and Data Loss Prevention Solution Development team. August 22, 2013 March 7, 2016 Sebastian WainComments are off for this post.